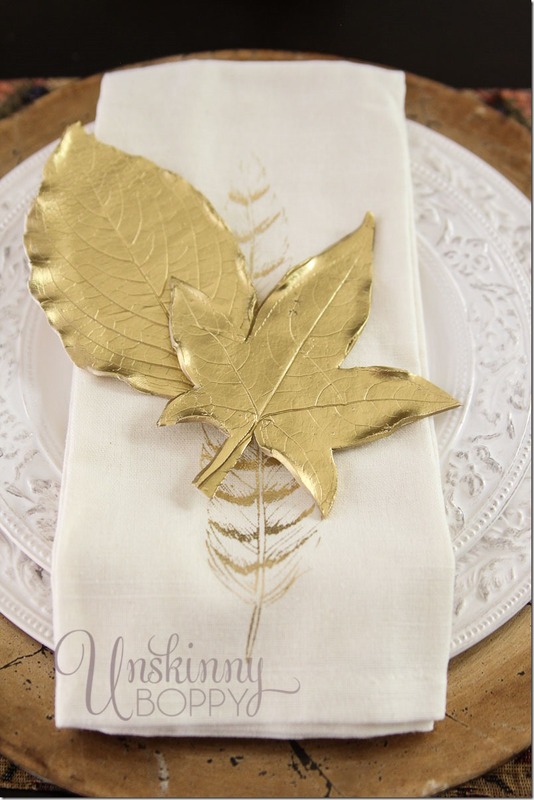 In yesterday’s post about fall decorating ideas I promised to tell you how to make these gold leaf place settings from my table. Are you ready? Don’t blink, you might miss it. Step 1. Gather leaves from your yard. I found that green hydrangea leaves worked really well since they left deeper grooves in the clay. The pointed sweet gum leaves worked well, also. Step 2. Flatten out a lump of white polymer clay so it’s about 1/4” thick. This will require a pasta maker to get the clay smooth and flat enough. Trust me on this. I’ve tried flattening out polymer clay by hand and it was pretty impossible. Running the clay through a pasta machine a few times is quick and easy. Once you have a nice big rectangle of clay, center your leaf up in the middle of it and roll it through the pasta machine right on top of the clay. I found it works better if you narrow the width on the pasta machine down just a smidge to get it to press deeper into the clay (but not too much or it will crush the leaf). 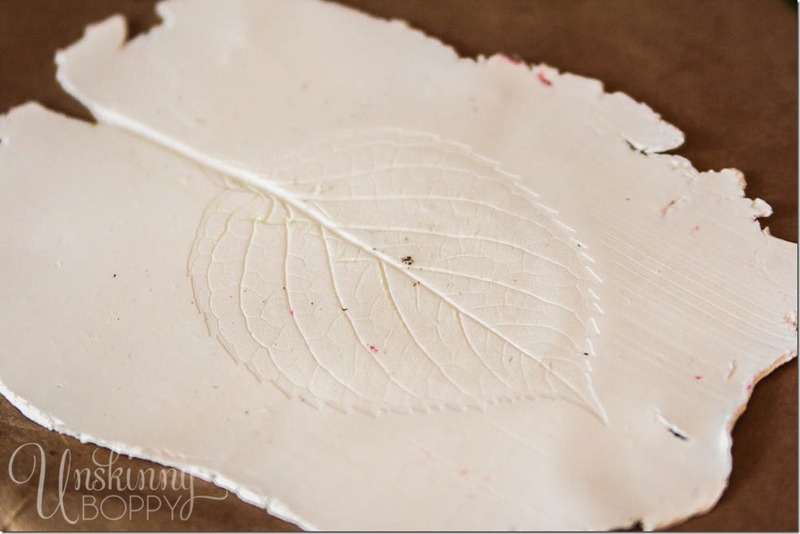 Step 3: Cut around the outside of the leaf shape and use your fingers to slightly crimp and smooth the edges to make it look like a real leaf. If you want to make an ornament out of these, now is the time to punch a hole of the string! I meant to do that part but totally forgot. 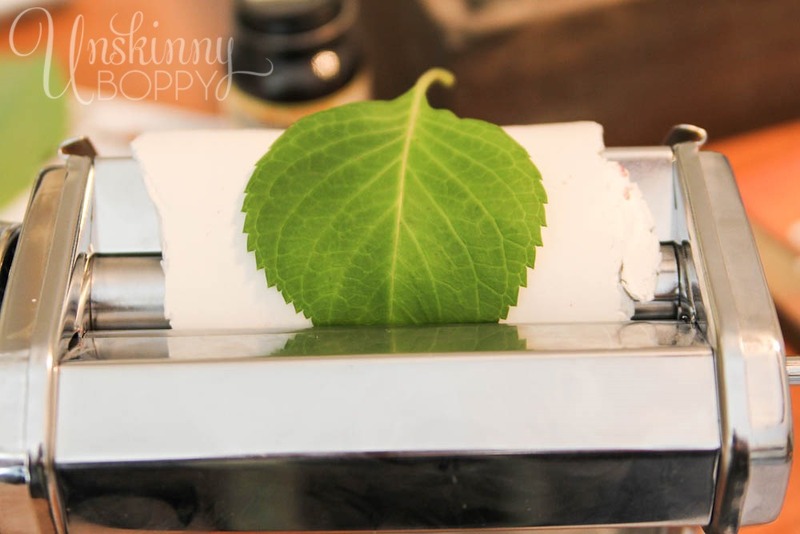 Step 4: Bake the polymer clay leaves on wax paper in a 250 degree oven for about 20-30 minutes. 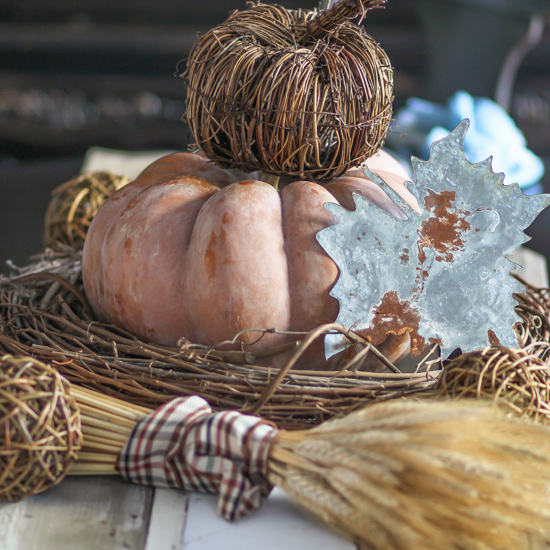 Let them cool outside so the stinky plastic smell doesn’t fill your house. Step 5: After they have cooled down, spray paint the leaves gold using your favorite spray paint. I used Rustoleum Metallic Gold spray paint on these. And that is it! 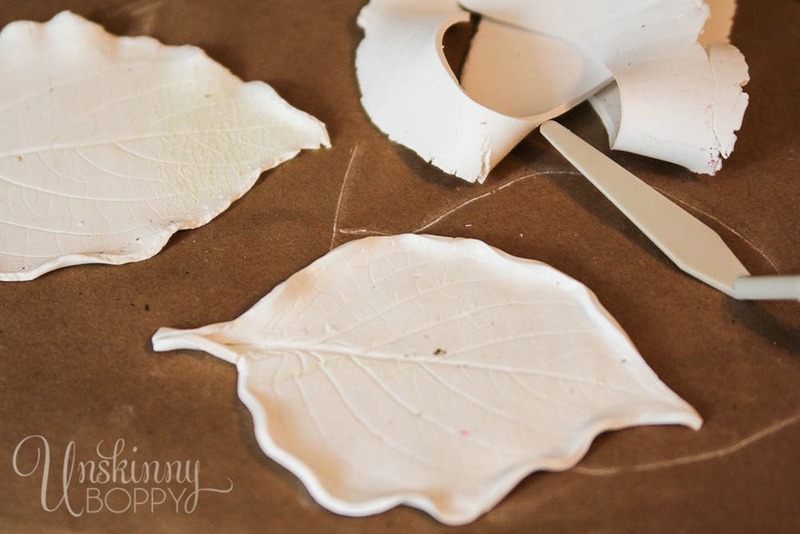 Five simple steps to creating golden leaves from polymer clay. These would be great on a Christmas tree or a fall wreath. Use your imagination and get crafty with it. 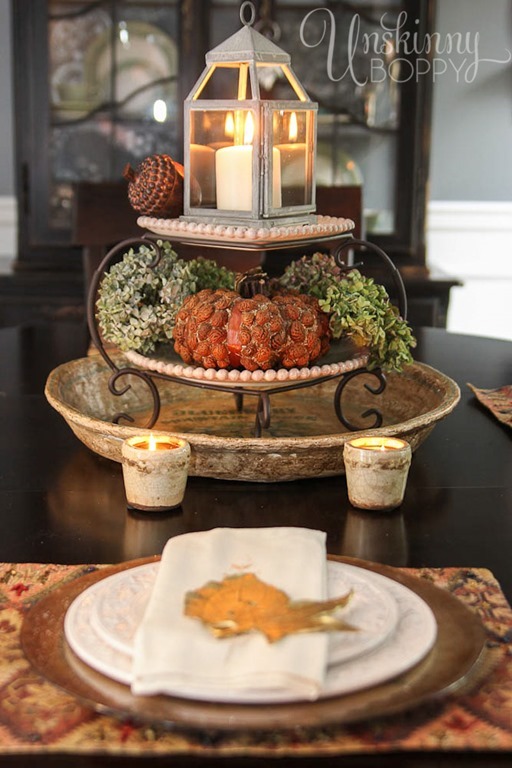 Want more Fall tablescape inspiration? 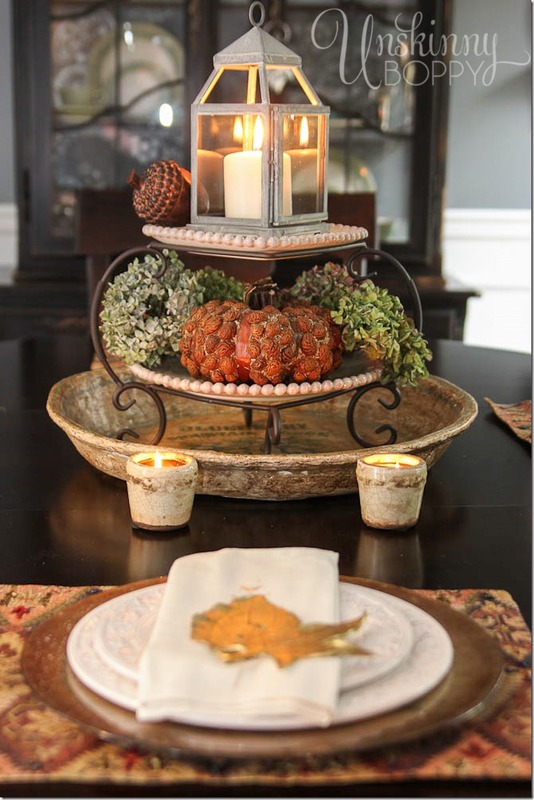 Check out my 2014 tablescape and placesettings! You are a genius!! These look like so much fun to make! Gotta go find my old pasta machine! It was super fun, Karen! I love working with polymer clay. It’s like play-dough for adults. Kelly you can use your hands and a dough roller, but prepare to get a workout!! Polymer clay gets more pliable as it gets warmer, so the heat from your hands will mold it. You can roll it out like a snake, then fold it over itself and just keep working it to get a piece that thin, but it’s going to be super frustrating, I can assure you. I tried to do it with my hands to make an ornament and it took a long time and lots of patience, but it was doable. The pasta machine made it super quick and easy. Clever, clever. Look out hydrangea leaves, here I come! Ok Midas, that was easy. Can you whip me up some plain old gold now? Hehe. Just one minute, lemme hide my donkey ears. I love this idea. I need to put it on my (long) list of DIY’s. Maybe for next year. Your blog is wonderful. 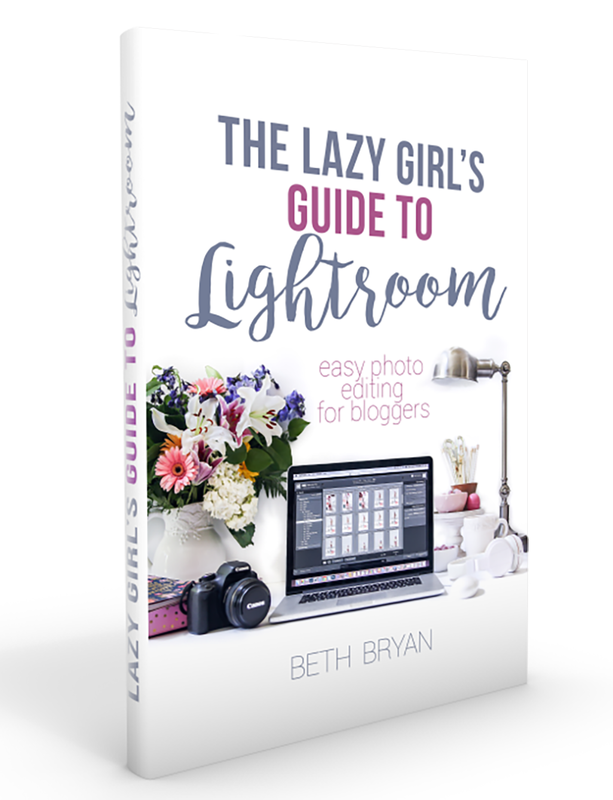 I just found it at the link party on Centsational Girl! I wonder if pressing with a book or rolling pin would work! I don’t have pasta machine but really love these leaves! Love these Beth! So elegant. What about using the pasta machine for food products afterwards, though? Will it be safe, or affect the flavor of any pasta run through it after this project? I wouldn’t use the pasta machine for food after using polymer clay in it. I bought the machine only for clay projects. But since I’m a kitchen slacker who buys all her pasta in a box, it works out just fine. 😀 Have a great day! Beautiful and inspired. You have an amazing eye. Are the gorgeous napkins DIY, or can you tell us where you got them? 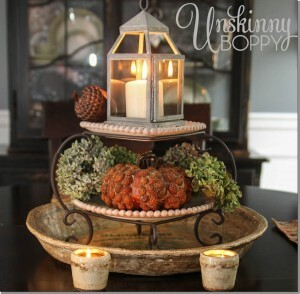 Congratulations on being featured on Pottery Barn’s blog. The gold leaves are perfect for the season. I actually was thinking they were real ones, that you had sprayed. Great job! Now, I must ask, did you paint the gold leaf outline on the napkins? They are perfect with the leaves you made. Wow! That is a fantastic project! You make it look easy. Congratulations for this project being featured by Pottery Barn’s blog! You rock, girl! Excellent idea! So simple and beautiful. I’m looking for cheap craft ideas for my Autumn wedding next year since we’re trying to keep costs down. I’m going to use this! Hi Beth, nice idea. Hey found quick way to hardest clay. As soon as it comes out of the oven, immerse it in very cold water. Sets the clay and hardens it fast. I keep a bottle in fridge labeled clay water, do not use for the purpose. Works great. What a great idea! Just one more reason I need to get a pasta maker!